The FTD® Healing Love™ Bouquet is a wonderful way to offer your heartfelt condolences for your special recipient's loss. Weaving together a bold assortment of blooms, this fresh flower arrangement consists of white roses, white Oriental Lilies, and white carnations with pops of blue delphinium and green buttom poms, accented with lush greens. 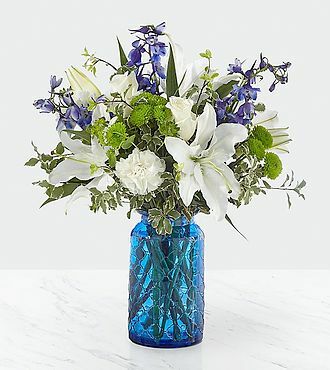 Presented in a stylish bright blue embossed glass vase, this sympathy bouquet sends a message of peace and love to their home or to the final ceremony during this most difficult time.